Can someone pls give me a quick guide of how to create a time series graph with multiple lines? It seems that there a is an explanation in the website but it refers to the old version of Visokio so it's not very helpful. your Layer choice will be either a measure or category field (e.g. salesperson, campaign). plus which measures to be represented with lines or bars. You can experiment by changing the Preset options (all lines, lines on bars, markers on bars...). Colour menu offers number of options to colour the lines /bars. Thanks a lot for the quick reply. However that's not exactly what I meant. I want to plot something similar to this: http://www.visokio.com/display-time-series. However I can't apply it in the new version of visokio since some features are changed. 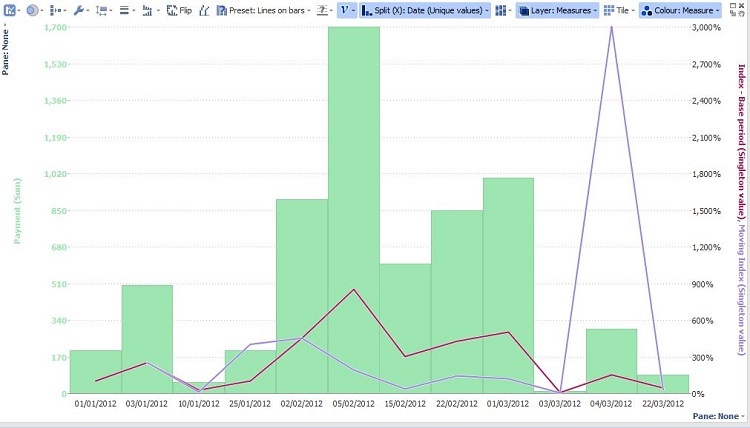 It is possible to create similar effect by using the Graph view - see the new demo. On the X scale choose a Date field, for Y the value field, connect on category field.